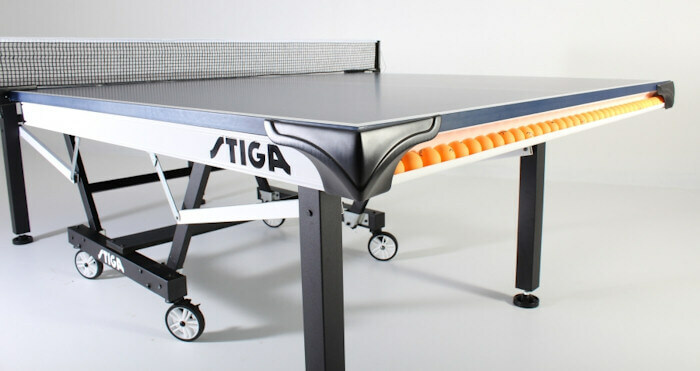 The Stiga (pronounced Steega) STS 420 T8524 is a tournament level table from an established brand. 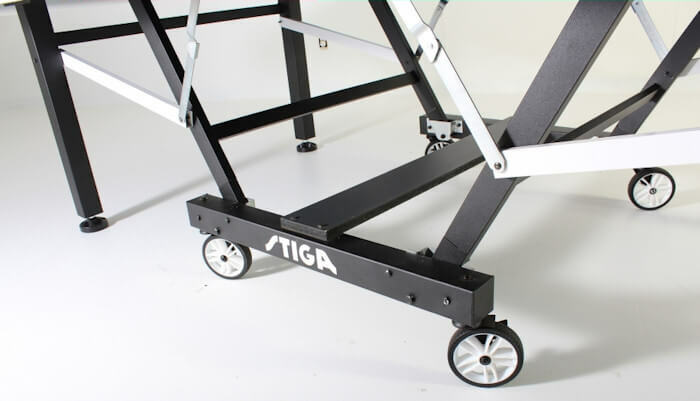 From the Stiga Tournament Series (STS) of tables, this is the fourth level in that series. So let's take a closer look at all aspects of this table so that you can decide whether it's the right table for you. 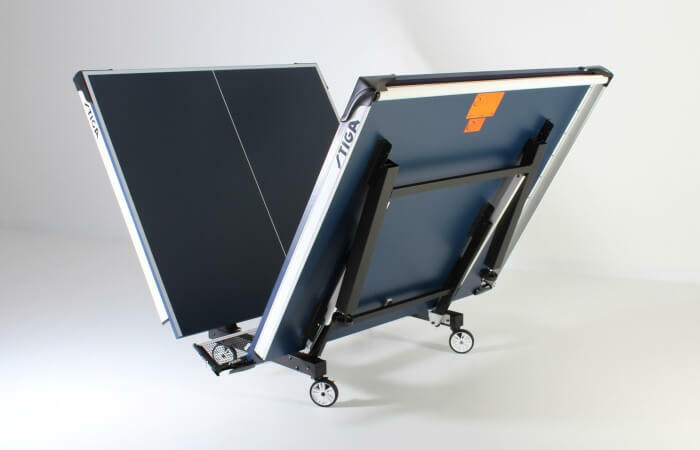 This enables one person to use the upright section of the table as an opponent (as shown in the video). This is how the table looks in its storage position. After you've assembled all the table pieces together, the table will be in one piece, with a lever system for preparing it for use or storage. This means that, after initial assembly, one person can erect it ready for use or fold it up ready to store it away. The corners of a table can be hazardous in certain situations, and this picture shows how the corners of this table are protected. This table has a section on the end where you can store table tennis balls (not supplied with the table). 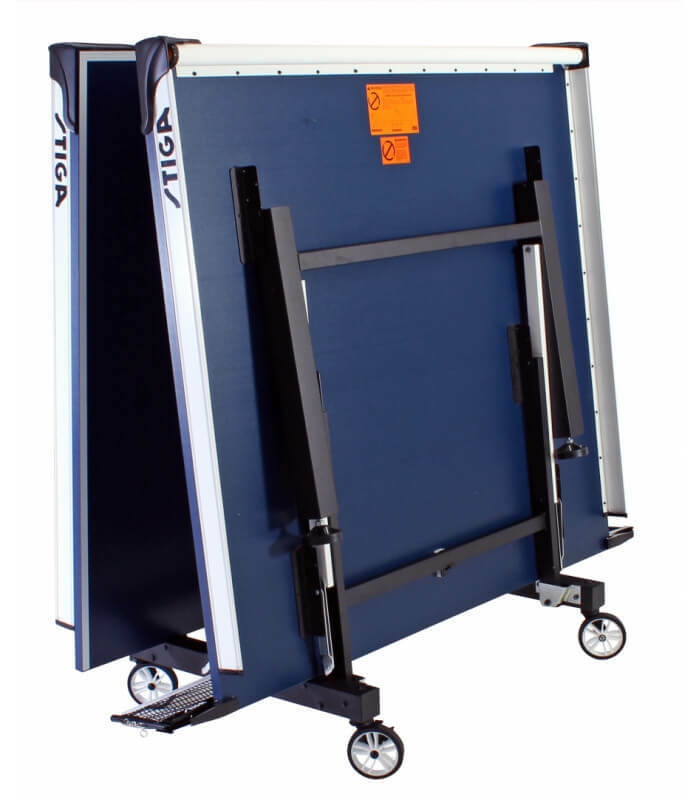 The 2½ inch deep powder-coated, steel-profiled apron, which is underneath the edges of the table, helps to provide stability and reduce the possibility of the table surface warping. 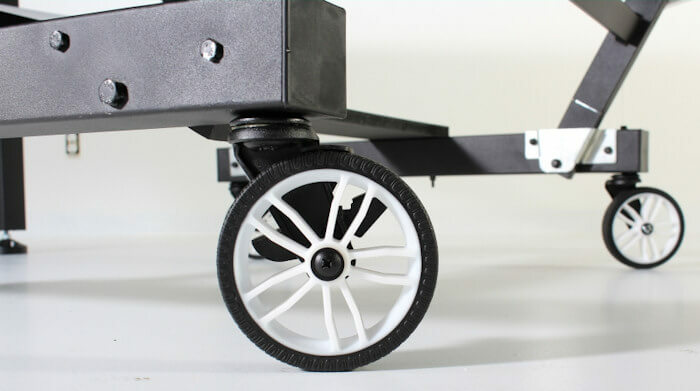 The 4 wheels used on the inner legs of this table are 5 inch mag wheels with sports tread tires and are designed to assist you to easily move the table to its desired location. Two of the wheels can be locked into position. The 4 outer legs on this table are 2½ inch heavy guage steel legs with a self opening function, which means that as you erect the table, the legs automatically open to the required position. 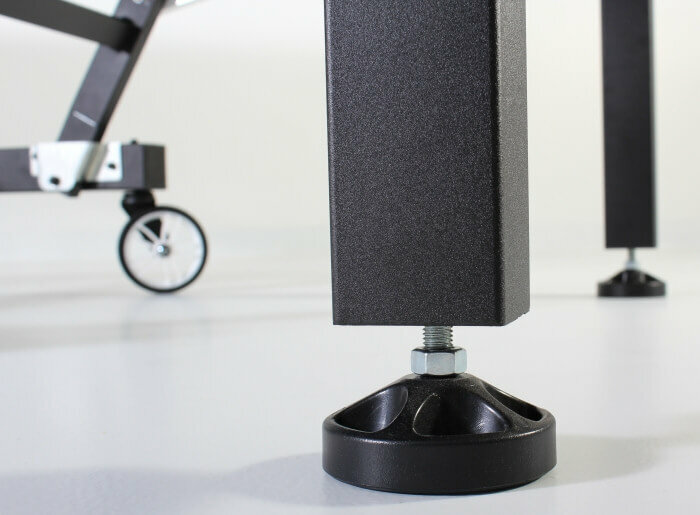 The outer legs also have 3½ inch leg levelers which can be used if the floor is uneven. The undercarriage on this table is much more sturdy than on cheaper tables, which means that the table will not move around when fully open and be less likely to collapse. 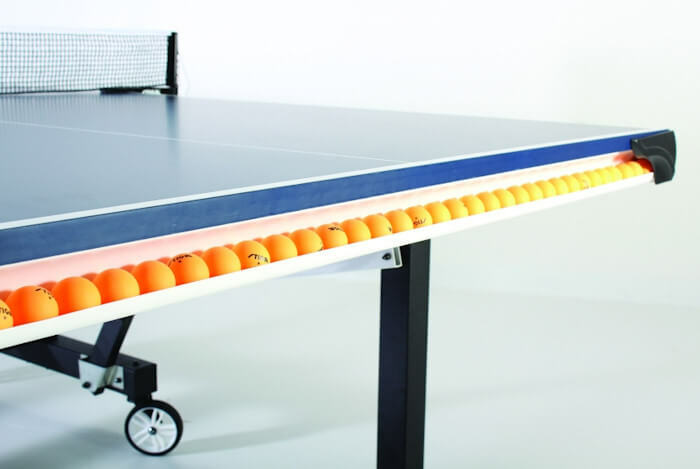 The net supplied with this table is 6 feet long and 6 inches high, so is the correct length and height according to the official Laws of Table Tennis. 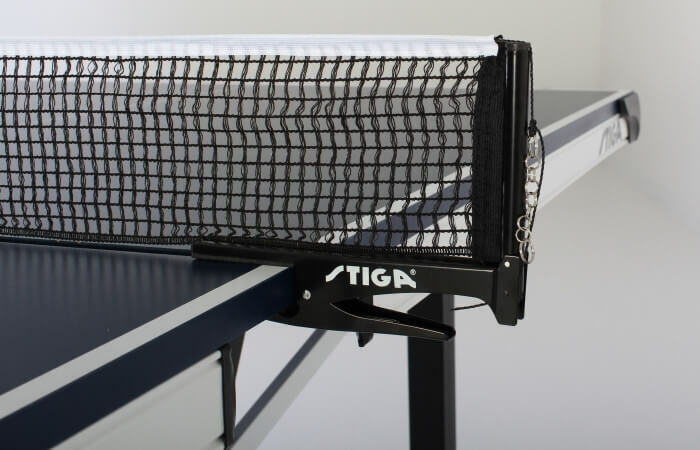 The net & posts set supplied with this table is the Stiga Premium Clipper which has a spring clip mounting system with net tension adjustment. This table requires minimal assembly, but will require three people. If you want to see how to assemble this table, I have included the instructions here. 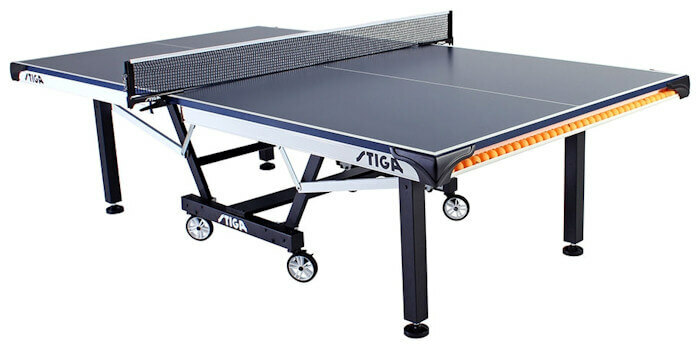 Who is this Stiga STS 420 T8524 Table Tennis Table for? 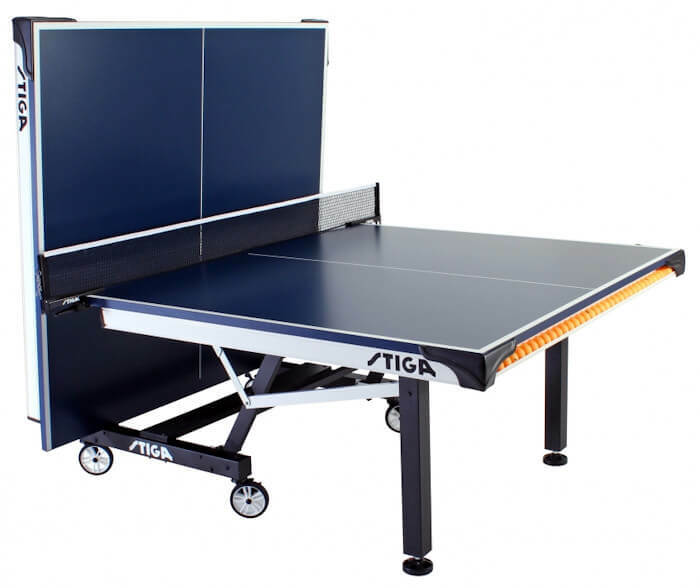 This table is primarily intended for players who want a very good quality table at a reasonable cost. It's designed for indoor use only and is not recommended for outdoor use. It's part of the Stiga Tournament Series of tables so is better quality than tables in their Recreation or Competition series. However, it hasn't been submitted for testing and approval, so it's not an ITTF authorised table. 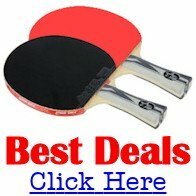 The standard of the net and posts set supplied with this table is excellent.